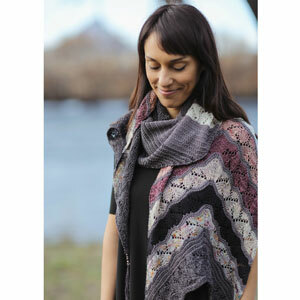 These gorgeous shawls were the featured project in our 2018 Craftvent Calendar! The calendars have sold out, but you can still buy all of the yarn needed to make Joji Locatelli's Get Together Wrap and Linda Dean's Quest Shawl, in all of the original colorways! Choose from Sugar Plum Fairy (mauve-y pinks) or Silver Bells (blues and neutrals) for the Joji's shawl and just Sugar Plum Fairy for Linda's! Each kit is packaged in a Namaste Oh Snap. A size US 6 circular needle (24 or 32 inch) - or size needed to obtain gauge - is required but not included. For the crocheted shawl, a hook size H (5.00mm) is required but not included. Contains the yarn needed to complete this project and the pattern. Koigu Color Kits and Lorna's Laces Lorna's Collaborations Kits are both similar kits: intermediate difficulty and scarf and shawls.